- a clever solution that works great! Link up to 4 together (16' each), go out up to 60 feet further! This is a self-energized amplified USB cable extension, that works! The USB signals going in and out of the extension cable are buffered to assure signal quality. The circuit board charges-up when not in use. This USB Repeater Cable allows a USB device to have its cable length extended by up to an additional 60 feet* by serially connecting these 16 foot cables. 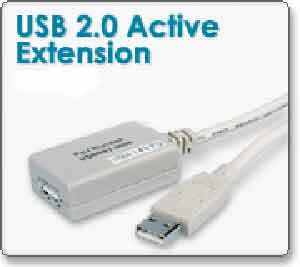 The USB Repeater Cable acts as a transparent USB Hub and buffers all downstream and upstream data traffic.